This Ebony Finished Zebrano Veneer Round Occasional Table has a luxurious, high end design appeal with a contemporary silhouette. The natural beauty of the zebrano veneer, curved leg supports, and pedestal base with shelf and Brushed Satina Brass accents make this piece stand out as an accent item in a living room or a nightstand in a bedroom. The round top with starburst veneers makes a great place to accessorize while the center drawer offers a drawer with metal hardware for useful hidden storage. 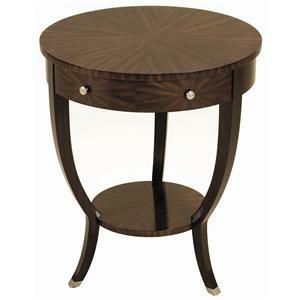 The designer finishes and artistic contemporary base make this end table an amazing accent for your home. The round top is crafted from black waxstone and penshell that complements the gold tone finish of the base. 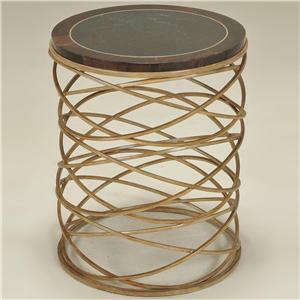 The metal base has the look of many interweaving circles for an eye-catching end table that shows amazing attention to detail. 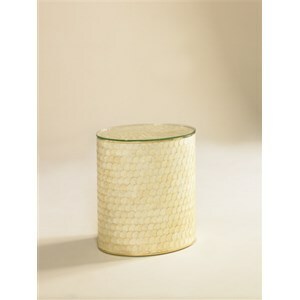 Provide your living room with a coastal look and feel with the addition of this beautiful capiz shell inlaid end table. The accent table creates a fish scale look with the inlays while a glass tabletop is perfect for resting a drink as you entertain friends or family. 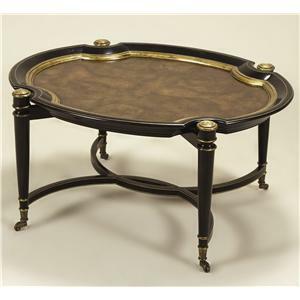 This oval cocktail with casters is the ideal entertainment companion. 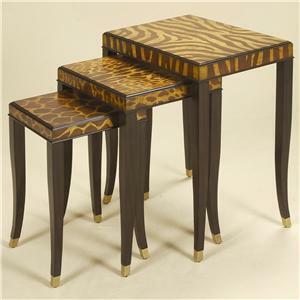 The Oak Burl veneer top sets the luxurious tone that continues with the hand painted black finish with gold trim. The sleek style look like a beautiful traditional tray set atop smooth tapered wood legs with curved stretcher base. 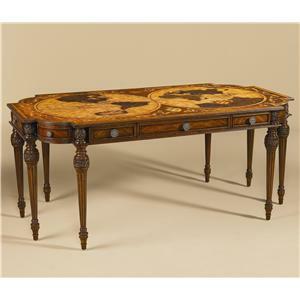 Add Old World appeal to your home with this finely crafted table for the center of your living room seating group. 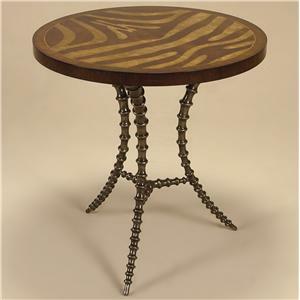 Definitely not something you see every day, this end table features a light tone zebra marquetry top to highlight the beauty of the wide veneers with an exotic appeal. The antique finished aluminum tripod base completes the unique, contemporary look with a base that seems to take inspiration from nature. 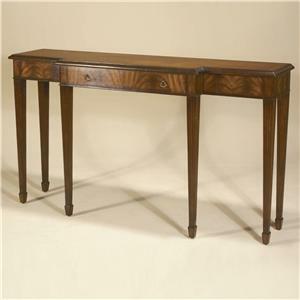 This Aged Regency Mahogany finished sofa table has a sleek style the effortlessly blends traditional elements with a contemporary Art Deco influenced silhouette that makes it a great addition to any decor style. The natural beauty of the crotch wood veneers makes this piece stand out as an accent item in a living room, foyer, or hallway. The spacious top makes a great place to accessorize while the center breakfront drawer offers a drawer with Dark Antique Brass hardware for useful hidden storage. 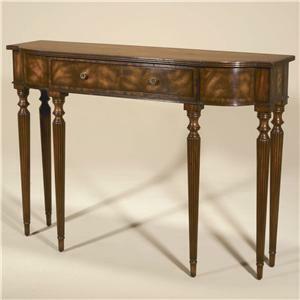 This Aged Regency Mahogany finished Sheraton sofa table has a traditional appeal with a silhouette transitional enough to make a great addition to any decor style. The natural beauty of the crotch wood veneers and turned, tapered legs make this piece stand out as an accent item in a living room, foyer, or hallway. The spacious demilune top makes a great place to accessorize while the center drawer offers a drawer with metal hardware for useful hidden storage. 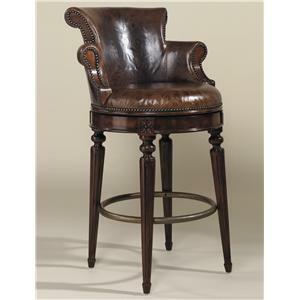 This hand crafted mahogany swivel bar stool highlights Old World charm with luxurious high-end finishes. From the Venetian Regal Leather upholstery of the back, arms, and seating to the carved wood, turned details of the frame, this swiveling bar stool showcases comfort and sophistication completed with the nailhead trim, Aged Regency Finish, and circular footrest.